From PGATour.com, amateur golfer Richard Lewis (no, not THAT 'Richard Lewis') broke the world record for number of rounds in a year Sunday, December 26, 2010. 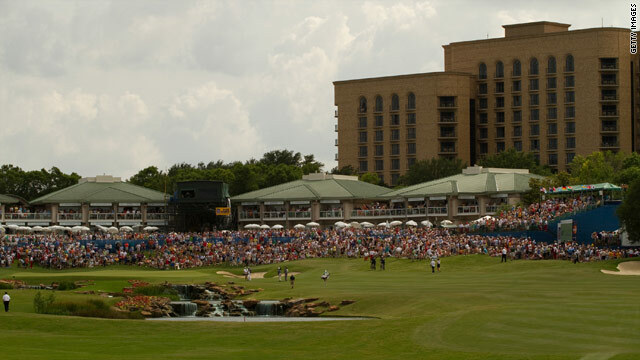 Lewis completed the task by sinking his final putt at TPC Four Seasons Las Colinas to finish his 600th round of 2010. At 11 a.m. Sunday, he smashed the Guinness World Record for number of rounds in a single season for an amateur and also set one that never even existed by walking every single round, all at the TPC Four Seasons twosome of courses. Four Seasons members paid up to $5,000 to play with Lewis, 64, on his milestone round in sunny and chilly conditions, with all money raised going to the First Tee of Dallas program. They raised a total of $8,800 for his milestone round and presented a check on the first tee at the Four Seasons before his round began. Lewis was certainly a trooper throughout his dream of setting the record, as evidenced by playing 36 holes on both Christmas Eve and Christmas Day. After completing his final round, the Guinness World Record Book officials will add Lewis' name to their records in front of the previous mark of 586 rounds set in 1998. It is reported on the PGATour.com website that Lewis, after paying his membership dues at Las Colinas, paid roughly $12 a round throughout his record-breaking escapade. He would also lose 35 pounds and four pants sizes. No word on his average round score, however.